We all know the massive benefits of yoga in weight loss and now, in this article, we are going to delve into the nuances of weight loss mudras which are again highly beneficial in loss of weight as well as for improvement in our general mental and physical health . Mudras have been in practice for ages rather since the beginning of Hindu and Buddhist traditions and it has been scientifically proven that hand mudras have various health benefits including weight loss. They say that in mudra formation, when the hand and fingers are positioned together in a predefined way, prana force or energies are generated which help in curing various diseases and ailments along with providing weight loss solutions. 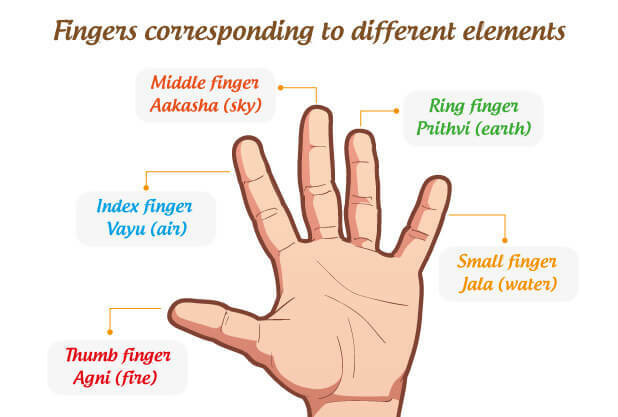 The logic behind mudras is that since five elements are associated with our five fingers, practising yoga mudras or hand gestures regularly can yield several health benefits. The logic behind this is that our specific organs are assigned to each finger and when we position a finger in a predefined manner, that specific organ gets activated which leads to the cure of various health problems like blood pressure, sugar, hypertension, mental illnesses, weight-related issues, heart problems, etc. In this part of the article, we will talk about five different types of weight loss mudras that help in losing weight by activating the corresponding organs in the body. Performing the Surya mudra increases the agni (fire) element thereby decreasing the prithvi (earth) element within the body . If we go by ayurveda, obesity and fat are majorly caused due to indigestion. The fire element in this weight loss mudra helps the body perform the digestive process properly which thus leads to loss of fat and body weight. How is Surya Mudra Performed? Put the tip of your ring finger on the base of the thumb and apply gentle pressure on the ring finger with your thumb. Doing this activates the fire element and leads to weight loss. Linga mudra is said to increase bodily heat, which leads to digestion and burning of fat which leads to weight loss . How is Linga Mudra Performed? To practice this weight loss mudra, interlock both the palms but keep the left thumb erected outwards and upwards. Given the fact that the thumb represents fire element, practicing this mudra regularly will increase the heat in your body enhancing the digestive power of the body naturally leading to weight loss. Kapha Nashak mudra is a combination of fire (agni) and water (jal) elements . So this mudra provides double benefits to the body, one the fire element present in this weight loss mudra improves digestion in the body and two, the water element present in this weight loss mudra reduces the body fat. How is Kapha-Nashak Mudra Performed? If you have excess heat in your body, you should practice this weight loss mudra in moderation. This weight loss mudra also helps in controlling nervous system and several other bodily movements. Here are a few health benefits offered by practicing this weight loss mudra: weight loss, better digestive system, improved nervous system, reduces fatness, infusion of energy in the body making the body active, solving of urinary problems, control of excessive menstrual bleeding, better skin and hair . How is Vaayan Mudra Practiced? Place the tips of your index (air element) and middle finger (sky element) on the tip of your thumb finger (fire element) and apply gentle pressure. This weight loss mudra helps in loss of weight along with solving various health issues as mentioned above. Gyan mudra is indirectly related to weight loss in the sense that it relieves the mind of mental stress that is related to eating disorder, mainly overeating . How is to Gyan Mudra Performed? Gyan mudra is generally performed coupled with meditation or other yoga asanas. Sit in either Sukhasana, Vajrasana or Padmasana as per your wish and comfort. Keep your back straight, holding your chest and head high. Rest both your hands on your knees and your palms facing upwards. Touch the tip of your thumb and index finger, keeping the rest of the fingers straight. Apply gentle pressure on both the index and thumb finger. This generates energy that calms your mind and body releasing the stress, which ultimately solves the impulsive eating problems. Gyan mudra, along with reducing weight helps you to adopt a stress-free life by reducing your stress levels. The weight loss mudras discussed above are highly beneficial for weight loss and should be definitely included in your lifestyle coupled with healthy clean eating and exercise. Practicing yoga  regularly also helps tremendously in weight loss. If you know of other weight loss mudras and their health benefits, please leave a comment below. We would be happy to incorporate those in our articles. For more information on weight loss, clean eating and healthy nutrition, please talk to our Truweight Nutritionist today. The first consultation is on us!